So now we have talked about how stress can be detrimental to your watercolor painting progress We will look at some additional techniques that can help you reduce this stress (stress management) so you can observe better and hence move your watercolor artwork along. As already mentioned, set yourself realistic goals. It will take years to master this medium. Enjoy the journey rather than loading yourself with goals like having to produce masterpieces in your first few classes. I had a student who had a very senior job in IT (Information Technology). For him watercolor painting was his stress management. He didn’t care how his work turned out, he just enjoyed being in class and playing with his watercolor paints. He ended up producing some quite nice watercolor paintings. Put it in perspective. Painting with watercolors is not a life threatening activity. You are talking about a few of dollars worth of paper and watercolor paint. That is it! If you find your work getting too repetitive try something new for a while. This could be a different subject, painting a smaller size, maybe force yourself to use a new color in a dominant manner. Before touching your paper think through the steps you are going to take for the whole painting. This will highlight any areas you are still unsure about which you should solve before you touch your watercolor paper. This is a key stress management point. If you know how you are going to proceed with your painting you will mostly be in control and hence your stress level will be lower. Look at a failed watercolor painting as a step towards success. Analyze your failed paintings to see what parts did work and what parts didn’t. Acknowledge success with the parts that worked and then look at ways to improve the bits that didn’t in future paintings. To help with your feeling of lack of control look at your watercolor painting and see just what you can and can’t control. So what can you control? Well firstly realize that you are in control of most things. For example you can control how fast he paint flows down your paper. By adjusting the angle of your easel from flat to quite steep you can stop any flow of paint down the page or speed it up. Also by using more water in your water- color paint mix it will flow faster, less water in the mix will reduce the flow rate. You can control the size of the paper you use. The smaller the watercolor paper size the more control you will have as it will not dry as fast and you can cover the watercolor paper with fewer brush strokes. Using a spray bottle to keep the shine on your paper will give you a lot more time to keep working on those wet on wet passages in your painting. You get to choose the size of brush you can use, etc, etc. So you really are in control over most of your watercolor painting stages. Now, what aren’t you in control over? Well while we can control the flow of paint down the watercolor paper to a large extent, it is very hard to come up with a totally predictable formula. So in this sense every time you touch the paper you are creating an unrepeatable brush stroke if it is wet on wet. How the water color paints flow into one another can be limited but not totally controlled – however this is an effect which gives watercolor paintings their originality. You can paint the same painting a dozen times but the wet on wet passages will always be different. In the end you will probably find that you really do want a little bit of uncontrollability when painting with watercolors. This is what makes it an exciting medium, but it should not be allowed to get totally out of control or your stress goes up and observation goes out the window! The first watercolor painting I ever did in class – just playing! Finally, give yourself some play time with your materials. The very first time I used watercolors I asked my tutor what should I do and he said just wet the paper and play with them. I have often given the same response to my students. 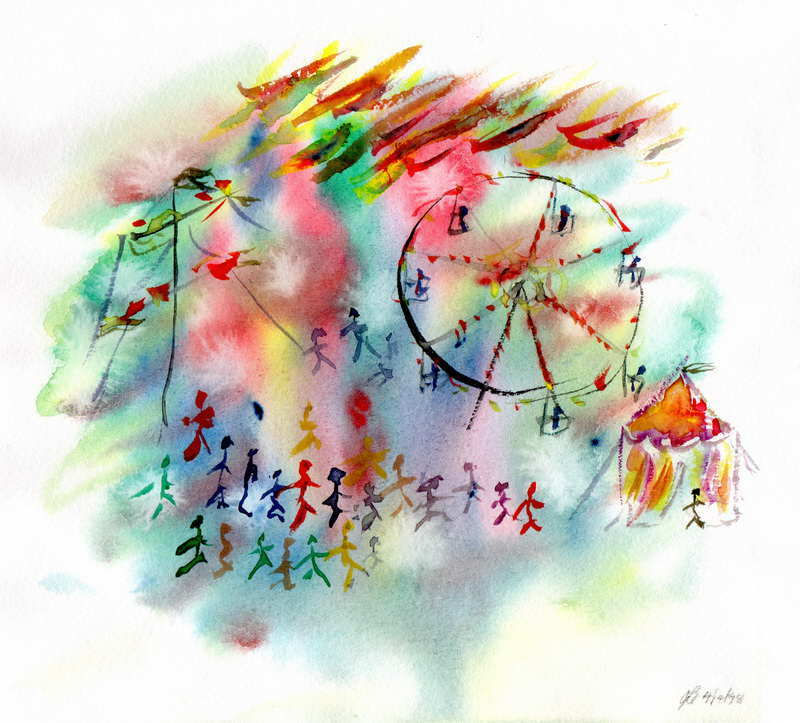 The simple watercolor painting on this page is the very first painting I did. It was quite small and I was just playing to see what the colors did on my paper. I still have it today and is a constant reminder not to take it all too seriously. There is no need for “Stress Management” when you are playing and having fun. Tackle all your watercolor paintings in a spirit of play and you will always enjoy the experience.